Adobe Photoshop Elements 9, the new version of Adobe's image editing and organizing application, adds a few interesting features, but nothing of an oh-wow nature--unless you're opting for the Macintosh version, which adds several features found in previous Windows versions. But whichever platform you're on, Elements 9 ($100, or $140 for the Plus version; prices are as of September 21, 2010) remains one of the better consumer-level image handling applications you can choose. Cropping (left) and framing effects in Photoshop Elements 9. The Photomerge Style Match feature in Photoshop Elements 9. You could accomplish the same thing by taking advantage of layer masks, a new feature in Elements 9 (but which has been in the full version of Photoshop for eons). With a layer mask, you can easily vary the opacity of elements within layers of your composition. That is, you can select, or mask, a portion of a layer, then reveal only that portion at, say, 50 percent. That ability helps create interesting compositions of multiple objects. Photoshop Elements 9's panorama feature: before edge filling. Photoshop Elements 9's panorama feature: after edge filling. Unfortunately, the Elements organizer doesn't leave me with the same warm, happy feeling. 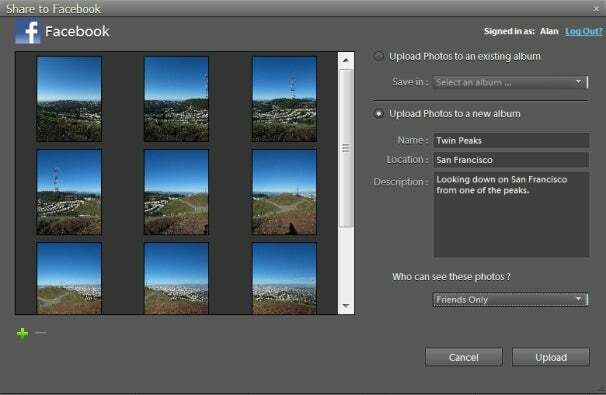 The organizer remains a separate application (it serves in Adobe Premiere Elements, too), and the separateness makes working with multiple photos clunky, even more so as Adobe adds features. When you want to perform substantive edits on an image in the organizer, you must select the image, click on a "Fix" tab, choose which editing mode you want to use, and wait for the editor to load. You'll then have two Photoshop icons in your taskbar--one for the organizer, one for the editor--and both applications' interfaces look very similar (with very tiny text and icons, by the way, even on a 24-inch monitor). Want to add tags to a photo? Use the organizer. 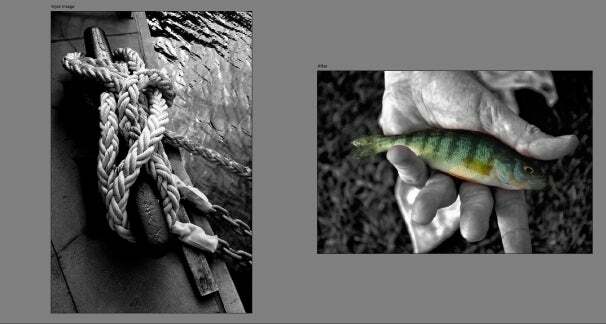 Want to create a photo book from multiple images? Use the editor. Photoshop Elements 9's Facebook photo upload feature. Another example: When you're done working on a photo in the editor, you can now click on a button that is supposed to let you share it on Facebook; but when you do so, it sends the image back to the organizer application to complete the action. (Amazing but true: This is the first time that Elements has had a tie-in to Facebook.) Once you authorize the application to upload images, you can select one or more images, enter an album title and description, and Elements will compress and upload them to your Facebook account, with automatic posting to your Wall. That makes it much easier to post several photos at once. The organizer's auto-analyzer feature attempts to discern and categorize photographic characteristics such as the quality of the shot, whether it's in- or out-of-focus, and the presence of faces. The auto-analyzer first appeared in the Windows version of Elements 8, and now makes its appearance in the new Mac version. The analyzer worked very slowly on my 64-bit Windows 7 system, often requiring 30 seconds or more to analyze a single shot, and at one point it sucked up more than 3GB of RAM, on top of the approximately 400MB of RAM reserved by the main Elements organizer application, and another few hundred MB for the editor. Elements is still a 32-bit application, by the way, unlike its full-blown CS5 brethren. Elements 9 has new options to create things: For example, select some images in the organizer, choose Photobook from a menu, get sent off to the editor application, and Elements then prearranges the photos in an attractive layout that can be printed on your own printer or uploaded to Kodak Picture Gallery or Shutterfly. You can monkey with the layout, of course; but in another significant tweak, by clicking a button in the editor, you can switch to "advanced" mode, which allows you to make edits with any Elements tool. That is, if you can figure out on which layer your image is located--the editor creates many different layers, and it wasn't always easy to work on them. The editor doesn't name the layers in such a way that you can use the names to figure out where things are. 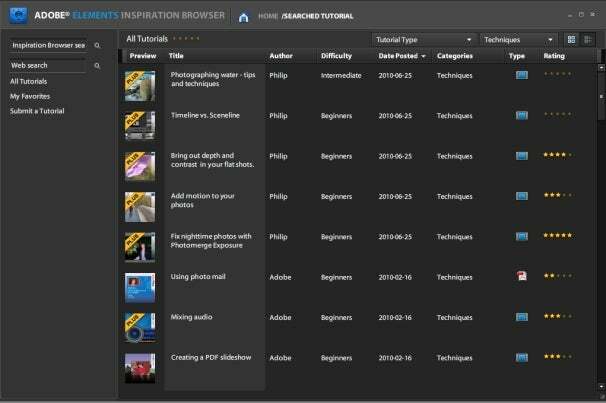 Photoshop Elements 9's Inspiration Browser. Adobe offers a "Plus" version of Photoshop Elements; it costs $140 and includes 20GB of space on Photoshop.com (up from the free 2GB allotment), plus access to a larger library of how-tos, artwork, and templates within the Inspiration Browser that comes with Elements. All that is fine--but adding 20GB of space on Photoshop.com costs only $20 a year. So you're paying $20 not to be annoyed by some of the content being locked in the Inspiration Browser. An excellent array of features and creative tools, but Adobe needs to combine the editing with the organizing.